BEAUTIFUL LAGOON VIEW. 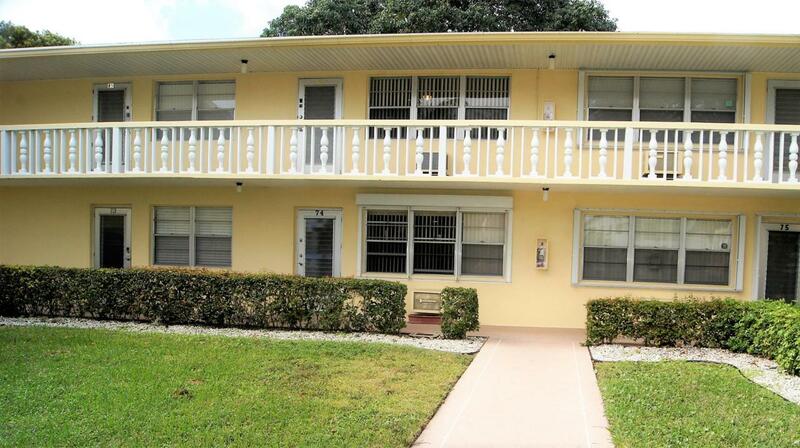 FURNISHED, ALL TILE, ENCLOSED PATIO AND LOVELY COMMUNITY PATIO. THIS BUILDING IS A SHORT WALK TO THE CAMDEN POOL.Century Village is a beautiful tropical adult 55+ community with over 7500 condos and villas offering many amenities. First class resort-style clubhouse with a 1200 seat theatre for shows and movies as well as game rooms for classes and clubs to meet and socialize. Century Village offers a lifestyle that is fun and affordable. Gorgeous lakes and lagoons with spectacular water birds to enjoy and boating too. Feeling the need for a workout? You can at the separate health and fitness center with its own resistance pool. This health club offers Yoga, Tai Chi and Zumba classes and much more. There are medical facilities on the grounds, Walgreens, hair salon, everything to make your time there enjoyable. Come and see for yourself, you will be glad you did.